Although it is the #4 vs. #1 seed matchup, the first round playoff series between the Ham Slams and Questionable Outfit will be the most anticipated first round series in recent memory. The Ham Slams are hoping to make history as the first #4 seed to win an EWL series, and Questionable Outfit are planning to repeat their history of first round success, return to the Wiffle Series for the third consecutive season, and become the first team in EWL history to repeat as Wiffle Champions. The Ham Slams have history going against them, as the #1 seeds have a 4-0 all-time series record in the first round of the playoffs, and #1 seeds have went 12-2 in first round games. Questionable Outfit is 2-0 in first round series and 6-1 overall in first round games, with their only loss coming in their first playoff game last season, when they lost to Eastbound & Dahn in game 1 before winning games 2, 3, and 4. The Ham Slams are 0-3 in first round series, 4-9 in first round games, and have never advanced to the second round. The Ham Slams have threatened in the first round, but have narrowly missed advancing to the Wiffle Series multiple times. In 2012, in their first year of existence, they pushed the eventual champion Fish Sticks to the brink, losing in game 5 of the first round. In 2013 they were swept by eventual runners-up Questionable Outfit, and last year, in 2014, they took eventual runners-up Cookies & Cream to a decisive game 5 before falling short. Questionable Outfit are the defending EWL champions, and, like the three champions before them, have an opportunity to become the first repeat champions in history. By advancing past the first round, they would also become the first team to reach the Wiffle Series in three consecutive seasons. Questionable Outfit swept the Ham Slams in 2013 before being swept in the Wiffle Series by Cookies & Cream. Last year, in 2014, they defeated Eastbound & Dahn in 4 games before beating Cookies & Cream in 5 games to claim the title. The Ham Slams finished in last place in the league standings with an 8-12 record, but they are likely the strongest #4 seed in EWL playoff history. After finishing the first half 1-9, the Ham Slams experienced a dramatic turnaround, going 7-3 in the second half of the season, which included a franchise-record five game winning streak. Questionable Outfit were consistent, as usual, going 7-3 in both the first and second half, and put together a six game winning streak before losing their last game of the regular season, which had no playoff implications. Questionable Outfit were historically dominant on offense in 2015, breaking multiple records, particularly with their power bats. All four players are a threat to go deep, but they also had three players in the top 5 league leaders for batting average and were the only team to hit over .500 for the season. With Morrison out for the playoffs, Bob is likely the most feared bat in the league, and his historic numbers back it up. Reilly has improved on offense each year and is a dominant power threat. Tom may be the most underrated and overlooked hitter in the league, and Mike picked up where he left off in 2013 after missing 2014, finishing 4th in batting average and slugging while tying the league record for triples. They are as strong as any team defensively, but they present as a Jekyll and Hyde from the mound. Reilly turned in another elite pitching season, but their other pitchers were spotty and inconsistent. The Ham Slams had the league’s worst run differential, but most of that could be attributed to a few terrible losses. The Slams finished third in most offensive categories, but turned on the gas in the second half of the season. In particular, Tim went on a rampage at the plate after starting the season ice cold, hitting .698 over his final 7 games. Dan was consistent throughout the season, finishing 3rd in batting average. and going deep in 6 of his final 7 games. Alan played in only 2 games in July, but hit well and became a strong fielder as the season progressed. Steve took a step back from his 27 homer All-EWL campaign in 2014, but when on his game, he is as good a fielder as any player in the league and hit 7 home runs in his final 5 games after hitting 2 in his first 10 games. Adam hit .590 with 6 homers in his final 4 games, but has only played in 4 games in the past 6 weeks. The Slams have improved in fielding dramatically over the course of the season, and it may not be a liability for them in the first round series. 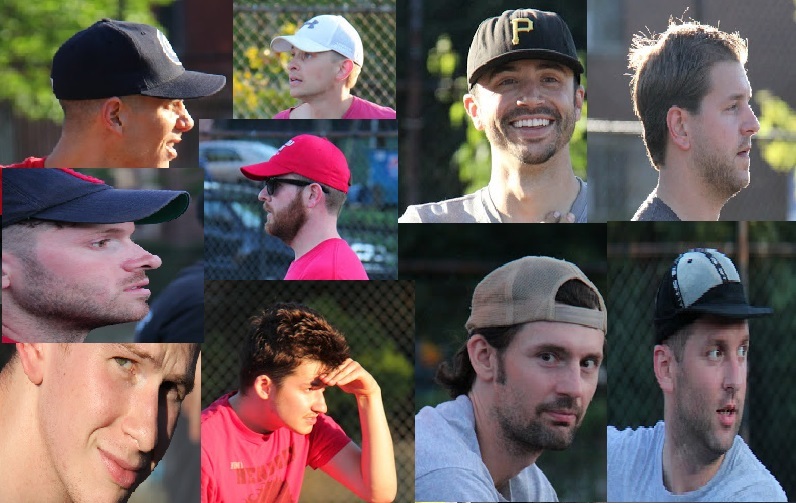 Their pitching has also improved, and is anchored by Charlie, who started the season 0-7 before reeling off 4 consecutive victories on the mound. 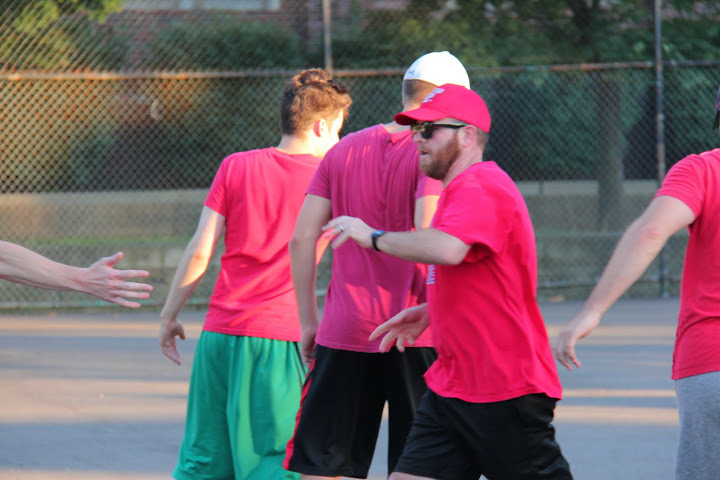 Questionable Outfit won the season series 6-1 and won the first 6 matchups between the two teams before the Ham Slams beat them in their final matchup, the next-to-last game of the 2015 regular season. The Slams have been on the rise all season, but Questionable Outfit are the defending champs with the most potent offense in league history. It should be a great series as the Slams try to carry their momentum and confidence from a strong week 10 into the first round against the legends of the wiffle diamond on Questionable Outfit.